Nothing trivial: $10k raised for T1D research in Melbourne! 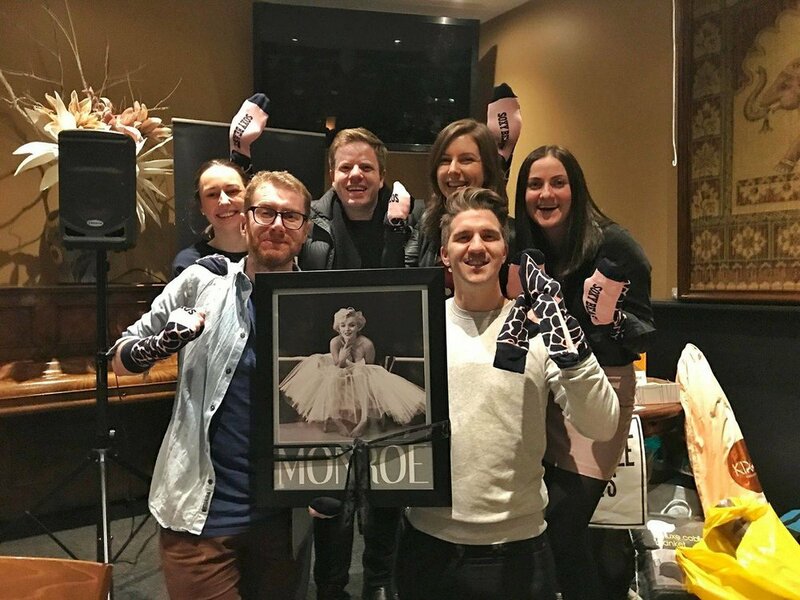 YLC are thrilled to announce that almost $10,000 was raised at our 2017 trivia night, graciously (and compactly) hosted by The Clyde. All of these funds have been donated directly to the Walter & Eliza Hall Institute's phase one trial of Empagliflozin, a promising new drug that improves blood glucose control (and therefore, general wellbeing and zen) in people living with type one diabetes. Our special thanks to local legend Peter Vigano of Jellis Craig for his incredibly generous $2000 donation, and all of our other donors who contributed prizes to our raffle. A heartfelt shoutout to our long time love Arbory Bar, who donated a hotly coveted bar tab as first prize. We would like to acknowledge leading researcher Dr John Wentworth for lending his time and charm on the night, and Sharon Bocarro at WEHI for her organisational support behind the scenes. Above all, we would like to thank you: our wonderful supporters who lent their time, trivia zeal, and sweet sweet cash to our cause. We’ve had a busy year at the YLC, and June has presented some changes in the makeup of the committee. We welcome Melisa Kelly, previously our Relationships & Social Media Officer, as the new President and thank outgoing President Natalia Sampaio for her hard work and commitment over the past year. This yearly change of guard gives us the opportunity to review our goals and strategies, and reflect on our achievements. Build a community for young adults in Melbourne with T1D. Established working relationships with two research institutes – St Vincents Institute and Walter and Eliza Hall Institute. Increased new engagement with YLC, including new members and contact with other organizations. Outlined areas of advocacy interest and priority within the committee, to be targeted in future. This year, in addition to our continued fundraising events and community support through Type One Tastings, we are also keen to do more advocacy work for young adults with T1D. We have identified key areas of advocacy priority as: Mental Health and T1D, access/funding for the CGM and insulin pumps, improved public and health worker education on T1D vs. Type 2 Diabetes, and education for young people on safety and T1D. Throughout the year, we will be focusing on these four key areas to determine how we can contribute to increased awareness and positive outcomes for young adults with T1D. We hope to participate in the growing public discussions on some of these issues, and thus further contribute to the T1D community. Bowls, Beer and BBQ Event Wrap Up! For us at the YLC, it’s the first time we’ve run a lawn bowls event. It’s proved to not only be a lot of fun, but a massive success, raising over $4000! We were all a bit skeptical with a gloomy grey morning in Carlton, but come 3pm, the sun revealed itself and set us up for a glorious afternoon of lawn bowls! Everyone brought their best game face and many a fierce competition was played. Taking the pressure off was a delicious lunch courtesy of Burn City Smokers - delectable southern style pulled pork and roast chicken burgers and corn on the cob. Yum! Thanks to family and friends who baked scrumptious treats for the bake sale! A big thanks the 100+ guests who turned up on the day, and to those who donated online! Your support goes a long way in funding research, and also increasing awareness about Type One Diabetes (T1D). Technologies such as insulin pumps (and potentially artificial pancreas!) improve the daily lives and long-term health for those living with T1D. Scientists are still trying to elucidate how autoimmune diseases like T1D develop. Research is so very important and this time we are proudly dedicating BBBBQ’s proceeds to the cutting edge T1D research teams at the Walter and Eliza Hall Institute! We’ll see you next year for another lawn bowls afternoon!